This week is Cycle with Style, the idea is to get the fashion conscious on their bikes. The idea has been put together by Birmingham Cycle Revolution to encourage cycling around the city. I don't have a bike but I have been looking at them a lot recently. I love the Victoria Pendleton range at Halfords. I've put together an outfit that I would wear cycling around the city. I love this cream leather backpack from Accessorize, its stylish when your not on your bike, big enough for your stuff and very practical, just pop it on your back so it doesn't get in the way. Leggings; I think leggings are the best for cycling as they are so comfy and you can move your legs easy. But don't opt for boring black sporty leggings. Pop into Forvever 21 where they having a massive selection of floral / autumn / aztec pattern leggings. I saw some gorgeous maroon floral ones perfect for this season. 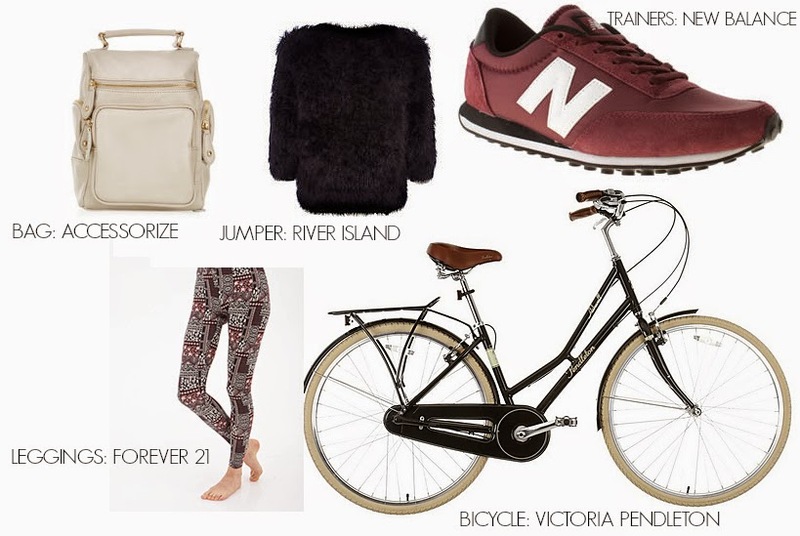 Finally to match the maroon leggings i've picked out these New Balance trainers that will make it easy to ride your bike, you can swap these for a pair of flats that you have in your backpack however i'm in love with New Balance trainers right now so i'd wear mine around town! You need to think about the products your using when your cycling too. Origins GinZing moisturizer is one of my favorites. It keeps the skin looking refreshed and hydrated so it's perfect for battling those cold mornings. To keep chapped lips at bay, make sure your using a good lip balm! Say hello to your new best friend, hairspray! Using a decent hairspray will stop your hair from looking so static and flyaway, this Alterna hairspray is designed for winter weather so it's perfect again for those chilly days. 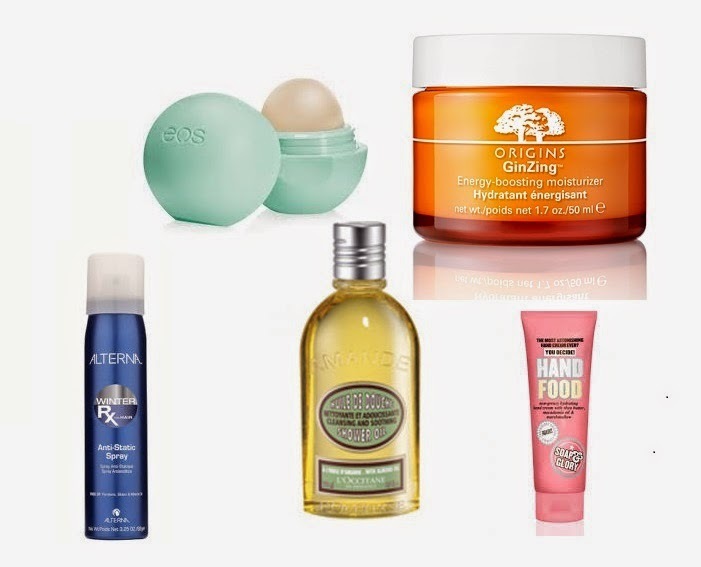 Loccitane shower oil is great at locking in moisture into the skin and Soap and Glory Hand Food is such a good hand cream and a great size to pop in your bag, keep your hands moisturized so they don't go dry and blistered.